Browsing old Letters to the Times today, I came upon the dour business of Oliver Cromwell’s head. I had always assumed that the Lord Protector’s overly solemn cranium remained united with the rest of his frame; but that is because I had not read the history books nearly carefully enough. Extraordinary, really, the whole business of what happened after Cromwell had lost sentience for the last time. He had shuffled off this mortal coil. As far as he was concerned, he died peacefully a great man, buried with pomp in Westminster Abbey on September 3rd 1658, his respectable place secured for posterity and eternity alike. The logical among us will hold that, while Lord Cromwell would not have chosen to be exhumed, dismembered and exhibited to the great unwashed of London, he never knew about it. What a breathtaking act of audacious spite, then, to dig him up; and not only that, but to hang what was left of him, and take his head and stick it on a pole high above Westminster Hall. Audacious, yes; but not necessarily unusual in those times. What remains truly unusual is the chapter of accidents which may – or may not – have befallen his befallen head in the 350 years since it took up its post atop of Westminster Hall as a new and titillating source of entertainment for the gawping gaggle below. You put something up on a pole like that, it’s going to hang tenaciously up there for a good long while. Down below the conspiracy theories were seething and bubbling like a witches brew. Cromwell had swapped around many a king’s remains during his lifetime, Samuel Pepys relayed from local tittle-tattle and hearsay. What if it wasn’t Cromwell at all, but a king? It could be King Charles I’s head up there, the wildly fanciful public speculated. 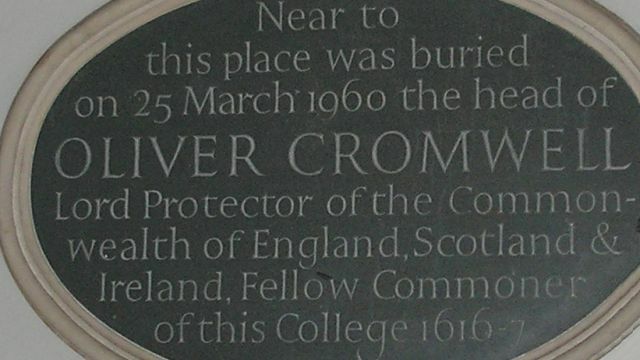 What if the family had taken Cromwell’s body to be buried at Naseby? What then? The head glared down in all weathers, taciturn, remonstrative. It was not for moving, but a storm broke the pole after a brief spell of two decades or so. And myth takes over as tales tell of a soldier who found it and squirrelled it away. By 1710 it was the prize exhibit in a London museum of curiosities owned by the Swiss-French collector Claudius Du Puy, where travel writer Zacharias Conrad von Uffenbach viewed it, allbeit distastefully. And for a while, after De Puy’s demise, the head went to ground. By the end of the 1700s, museum owner James Cox was convinced he had found it once more. It belonged, he was sure, to an inebriate actor names Samuel Russell, and whilst Russell would not sell it, Cox contrived to make the actor indebted to him to the tune of £100 so that he had no recourse but to give it up. The head’s fate was to be sold on, in a chain of curiosity museums and private owners. Until 1911, and the letter I read to the Times. Archaeologists had just pronounced the head a convincing possibility, and Mr C.R. Haines wrote: “Is it not high time that some steps should be taken to put an end to the national scandal of keeping this ghastly relic as a curio? The vicar of Stoke- by-Nayland, Colchester, who had inherited the head, later bequeathed it to Cromwell’s old college, Sidney Sussex College, Cambridge. And on March 25, 1960, the head was finally laid in the ground, in a secret location at his alma mater. January 30, 1661 to March 25, 1960. After 299 years of scandal, the Protector slept once more. Though, obviously, in two different places. Posted in Quirks of HistoryTagged england, head, history, letters to the Times, oliver cromwell, Westminster HallBookmark the permalink. I think Mantel writes about Thomas Cromwell, not Oliver… Maybe you can help me- as I read this I was waiting for his head to turn up in Drogheda. Did I make that up, or is there some tale of a bit of him still here in Ireland? Ha, that is hilarious, I really must think more before I click post. I must, indeed, have made it up! A scrambled brain, half remembered history… It’s as well you can keep me right Kate! Yep! 100% pure Celt unless you could some rapey invading Normans a few hundred years back. I had been vaguely aware that the “head” had been on numerous trips around the hinterlands, but, was not aware of such detail until reading this today. It is interesting to read of such antics and think of them as rather barbaric until we compare actions of folks today around the globe. I would venture that there is at least as much barbarism at work today and still at the governmental level in the name of whatever is the latest “truth” according to such governments. Tis true indeed that the winners write the history. “…the head went to ground” is a particular favourite of mine in this piece, and is probably the reason why there are so many troubled, headless spirits wandering around dark corridors in the depth of the night.. I thought you might like that one, Roger. I am a terror for mixing my metaphors. Interesting, Kate. I may have mentioned Paul Collins to you before (Sixpence House) but, your post brings this author to mind once again, making me wonder if you might like him. He wrote an interesting book, “The Trouble With Tom”, which researches the whereabouts of the remains of the man who helped ignite the American Revolution, Thomas Paine, with parts of him on both sides of the Atlantic, was an interesting man and the book begs for a bit of studying by the likes of you. Penny, I have ‘The Trouble With Tom’ on your recommendation, and a rollicking good read it is! I love Collins’s style. Wonderful book. Dear Kate, it’s all just a little macabre isn’t it? There seems to be in us humans a hunger for that which titillates. An accident happens on the highway and everyone slows down to see what they can see. A fire rips through a house and all the neighbors gather for the latest. Part of it is probably that we want to know if anyone is hurt and if we can help. But part of it also, I suspect, is relief that this tragedy isn’t happening to us. Humans are, indeed, a strange and wonderful creation. Peace. Hi Dee! I see you have mastered the art of understatement. Just a little macabre, it is indeed 😀 Whatever marvels at such things is unquestionably more Caliban than Ariel. A grave matter, indeed, Kate. A reminder to us all not to lose our heads over pebbles in the path . . . or we might reach our wit’s end as no more than a skull on a stick. As always, you’ve excavated and exhumed a marvelous and macabre nugget for our reading pleasure. Thanks, Nancy 🙂 Must do something upbeat tomorrow. Too many bones this week. Kate, a mother and crafter living in a village on the outskirts of London, England, shares wonderful seasonal projects she does with her son, Harry. From homemade pinecone firelighters to ornament-like winter birdseed feeders, Kate’s arts and crafts activities are not only fun and festive, but beautifully presented on her blog. I wonder if that Kate lives anywhere near you? I’m the first to admit that my kitchen skills leave something to be desired; my husband was mildly astonished by my culinary incompetence when we married – my party trick was to peel off the film from a microwave meal with one hand whilst programming it with the other – and things have improved only slightly since then. As such, Harry and I look for recipes which produce stunning results but require very little skill. I’ve had a look: lovely site! I shall potter off and leave a comment later. We can’t be that far away from each other. And her philosophy is just right. I didn’t know that they did a lot of mixing & matching of heads–I did know about Oliver Cromwell’s head being displayed on a stick, but not about the other stuff. Personally, I would have enjoyed seeing Cromwell’s head paraded on a stick and then boiled in oil. But that’s just me. No, not just you, most of his protectorate too, Weebles. Banning Christmas was now a good move. I saw an interesting 3- or 4-part TV series called in the UK “The Devil’s Whore” and in the U.S. “The Devil’s Mistress.” I guess that’s because we are still Puritans. Like Cromwell. It’s about a woman who is caught up in the middle of the civil war–she’s got royal connections to King Charles, her first husband is executed by Charles, though, then she marries someone who is fighting for Parliament and Cromwell and against the king, that husband is murdered, and then she marries a mercenary hit man (played by John Sims) who worked for her second husband. He turns against Cromwell and other bad stuff happens. I thought it was good. Unless I’m muddled and Cromwell and Parliament were not on the same side against King Charles. Good acting, sword action, romance, bloodshed, etc. All the things we Puritans love. I feel a little sorry that I am laughing so hard! The wording on that plaque has me in stitches…”Near to this place?” In the general vicinity? What an odd story, the likes of which are why we have the saying, “Truth is stranger than fiction.” I’m so glad they buried that head before the advent of Ebay! That mention of Ebay really tickles me! My imagination is running riot. There was just something special about this post! Kate really knows how to root out the unusual, and the whole idea of a “missing” head for some reason makes me laugh, too! Uneasy lies the head that wears … (in this case, wore)… that about sums it up! Even if he wasn’t actually crowned it amounted to the same thing. Yes, Col:Lord Protector was a kingly post indeed. This post is at once intriguing and gory. That is a great mix to kindle interest. To be frank I had never been aware of these details regarding Oliver Cromwell and find it fascinating. Tell me Kate and I ask this as the post does not throw much light on this aspect. What could have been the reason to substitute a dead body?In terms of value, there would been countless bodies of royalty and other folks to choose from…..
Hi Shakti! There are two aspects to this: the first, and more probable, reason for a swap is that his relatives just wanted him to rest in peace, and I believe one theory has his family swapping a pauper’s corpse for his so they could bring him back to the family home. 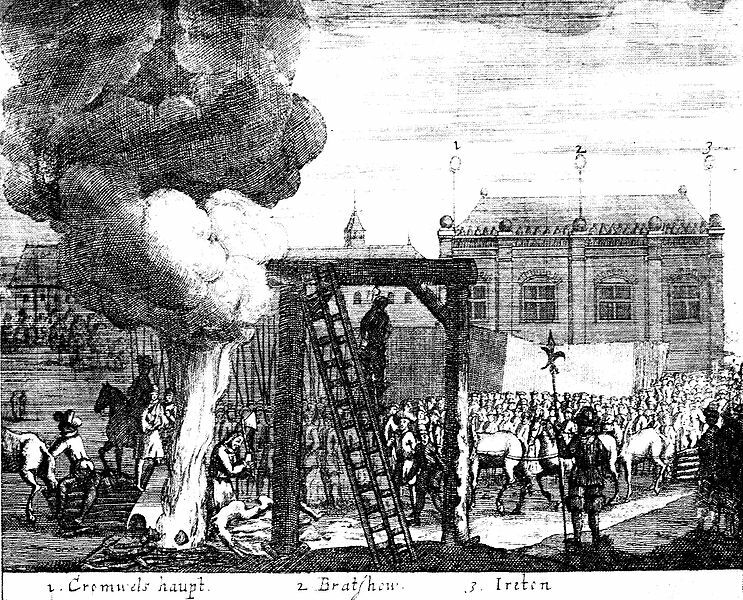 The second is that roundheads did not just melt away when Charles II came to the throne. There was a solid mass of sympathisers and making a martyr of Cromwell would have served the purposes of any who wanted to rally them and reclaim England for the Parliamentarian cause.